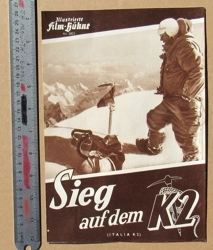 This is an original illustrated flyer for the German language adaptation of the official movie of the 1954 first ascent of K2, SIEG AUF DEM K2 (ITALIA K2) mostly filmed & photographed by Mario Fantin. This is not a modern copy. It is original and dates from the time of the original 1950s release of the film. The front measures 264mm tall x 182mm (10.39 inches x 7.17 inches). This flyer is a single sheet folded once as issued. The front is a small version of one of the original posters for the movie. 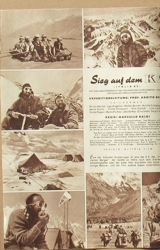 Inside there are 13 photos from the Italian expedition, credits for the Italian oriiginal, credits for the German adaptation, a short summary of the 1954 expedition. The rear cover is illustrated by a small version of another original poster for the movie. Several fyers were issued for the movie with different cover illustrations and different photos inside. This example is one of the largest versions (by size) of the flyers. 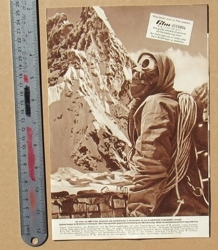 CONDITION: Original printing/issue from the time of the film's initial release in the 1950s. The flyer is on quite flimsy, cheap paper. This example is in clean, bright condition, with no tears, no creases other than the single fold as published, very minor corner wear. This item is very uncommon in nice condition without creases. Most surviving examples were folded and put into books. Price: $85.